Mike Bike - Bangor PA Love the top opening "Bought these recently, i was torn between the 35 liter and these smaller 22 liter side case's , Top opening is great , i have a 45 liter top case,so i felt i could survive with the small side case's, install was a breeze ,just don't install your top case first, not a ton of room, although keeps the bike from having to wide of a rear end. 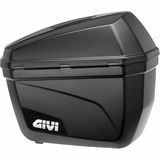 high quality , nice quick removal, overall happy, if you do multi-week trips, go for the 35's"
Mike Bike - Bangor PA Givi Side Case Mounting Hardware "Along with Purchasing Givi 22 liter hard side cases , you need to buy this mounting setup, it is specific to your bike, if you are also going to install a top case, you need to install the side case mounts first. 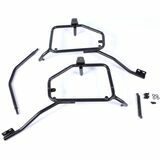 mine were for a 2012 Suzuki Vstrom 1000, installation was very easy, fit was perfect!! I switched from soft side bags to these, Much nicer setup , High Quality item, overall very happy with purchase"